Anyone watching the athletics during the Olympics coudn't fail to notice the 1/4-scale replicas shuttling between the throwing areas and where discuses, javelins, shots and hammers land. The small MINIs have caused quite a stir with both spectators at the stadium and those watching on TV. 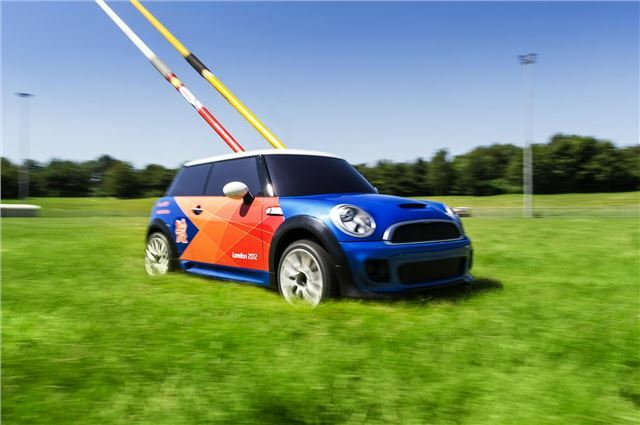 MINI was apparoaced by LOCOG to build a memorable vehicle to return the equipment for the throwing sports and the end result was designed and built by apprentices at the Oxford factory. There are three of them, which cover around 6km a day in four shifts and can be used continuously for 35 mintues before needing a recharge. The equipment is placed into the car when the 'sunroof' is opened. The cars are controlled by three 'gamesmakers', volunteers who seem have ended up with one of the park's plum jobs. Because it's a near-perfect replica of the famous small car, the mini MINIs have come in for some criticism. Advertising and brand promotion is specifically banned within the Olympic stadiium - you won't see a single advertising hoarding anywhere. So the sight of three small MINIs racing around the field of play has raised more than a few eyebrows. Although it carries no logos other then that for the 2012 games (look closely and you'll see there isn't even a MINI badge on the front), it has been claimed that it's advertising through the back door as the car is so recognisable. Olympic officals on the other hand insist that there's no link between the sponsorship and the mini Minis on the field of play. They instead see it as one of the many quirky elements that have made the games so memorable. The cars will also be in action during the Paralympic games.